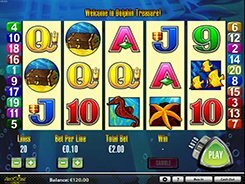 Dolphin Treasure is a five-reel slot with 20 paylines and is themed around sea. A player may adjust the number of paylines (in multiples of 5), and a bet per line ($0.01 to $2.5), thus the minimum and maximum stakes are $0.2 and $50 accordingly. Design-wise, the slot has rather simple but polished feel. Feature-wise, Dolphin Treasure resembles classic slot machines, with nothing more but a wild, a scatter and free spins. The symbol set includes playing card values from Nine up, as well as starfish, octopus, turtle, and other sea related icons. The Sun symbol is a wild that substitutes for all symbols except for the scatter. Besides, the wild pays out the largest jackpot of $22,500 if these five occur on an active payline. The Treasure Chest is a scatter, with three unlocking 15 free spins no matter how many of them have appeared in the triggering round. All wins are trebled during the free spins. There is also the Gamble feature that is offered after every winning spin. In the Gamble feature, a correct guess of a card color or suit will double or quadruple the winning.